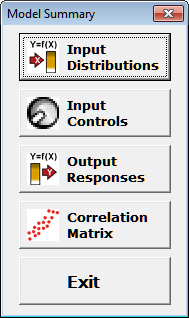 Click Model Summary and select a summary of Input Distributions, Output Responses, Input Controls, or Correlation Matrix. The Input Distributions summary table displays all of the Input Distributions with the selected distributions, parameter values and settings. The Output Responses summary table displays all of the Output Responses, specification limits and optimization options. The Input Controls summary table displays all of the Input Controls, type, and optimization boundaries. The Correlation Matrix summary table displays the entire Correlation Matrix. Summaries of the Input Distributions, Input Controls and Output Responses are also included in the Simulation Report.